Searching for 24/7 Emergency Water Damage Clean Up? Download your coupons and save on carpet cleaning and other services. Request your carpet care guide and learn how your carpeting and flooring can last for years to come. Download it now! At Advantage, nothing is more important to us than a satisfied customer. We work hard to earn our reputation as a Michigan carpet cleaner and restoration services company that is know for being honest and ethical in everything we do. Carpet cleaner reviews are a great way to research a company before you even pick up the phone to call them. Below are some of the reviews that our customers have given us over the years. We love to include you on our list of amazing customers who we have the privilege to serve. 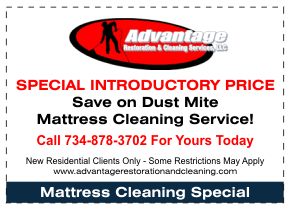 "Advantage Restoration cleaned the carpet in our newly purchased home and did a fantastic job! The cable guy came the next day and said he didn't want to walk on the carpet because it looked brand new, and it really did! Thank you for a job well done! I'm gald I went with a local, family owned company! Thanks again!" "Greatest and most considerate carpet cleaning service! They also clean our business, and have taken care of a sub-pump backup. Chris and his team are full service life savers! Thanks Advantage!" "They were at our home in less than 45 minutes from the time we called and handled our water situation from start to finish. We didn't worry about a thing. We actually went on vacation and returned to find our house back to normal. They are the best!" "When we had water damage in our home's basement, Chris came out to our home and would not leave until our it looked like new. A few months later we had them start to clean our office building on a regular basis which include everything from vacuuming, garbage removal and dusting, to windows when needed. We have been incredibly pleased with their quality of service." "We are proud to recognize Advantage Restoration as the best in the business. They definitely care about their clients and make every effort to provide that high level of service in satisfying the client under delicate circumstances." "it was a pleasure doing business with you. Your company has integrity - you say what and when you will do and you follow through. Many companies do not call back promptly and keep people waiting for them. Advantage called when they said they would and came at my appointed time." "Words cannot describe the magnificent care yo took to clean our carpeting and upholstery. We used to use another carpet cleaning service. Your service is hands down 300% plus better!" "Very professional and educated in cleaning of all types of carpeting. The carpet looks so much better. It is not easy re-doing carpeting that the previous people messed up big time." "You were very professional and flexible. You spent the time answering our questions and payment options. You were able to clean a carpet that we thought wouldn't come clean. You are our future carpet cleaner!" "Courteous, caring and competent. You made our 8-year old carpet look new and removed stains and odors I thought would never come out." "Chris took the time to use a cleaning procedure that most companies wouldn't use and came back when there were still a few stubborn dirty spots. We are very pleased with work that was done." "I want you to know I am completely satisfied with the cleaning. Your follow up is outstanding and I Plan on continuing to use you company for my carpet cleaning needs"
We are located in southeastern Michigan and will have a cleaning representative come to your home and perform a free carpet cleaning audit. This inspection process will determine the type of cleaning method that is most suitable for your home. From the results, together we can determine the best techniques to return your carpet to peak condition. To get started, call 734-878-3702 to schedule your appointment online today. © 2011 Advantage Restoration and Cleaning Services, LLC.